When hanging out with friends for New Years, whether, as host or guest, I love snacking on small bites. When passing a table of food, I’m prone to grab something I can eat in a couple bites. It’s almost a tactical strike. I’m in, I’m out, I’m chewing, I’m good. While there are countless ways to put together a holiday appetizer spread, I always include a much needed variable sadly neglected by some in the dead of winter: the grill. 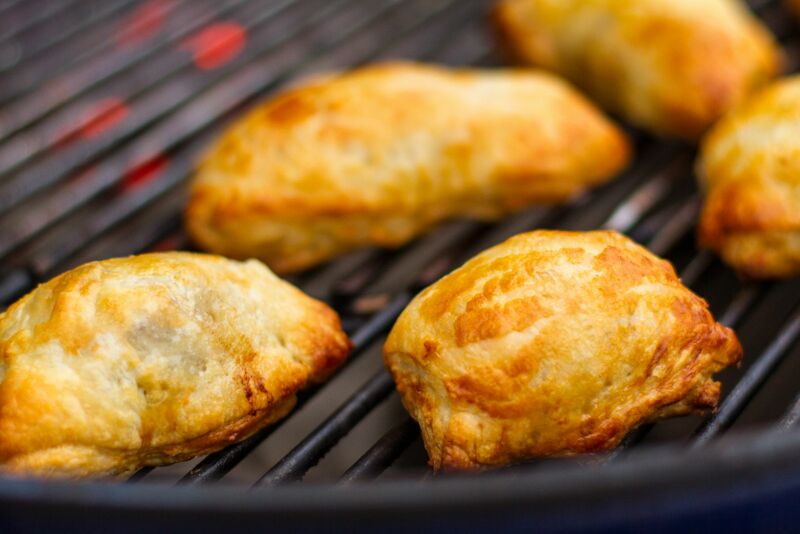 I love the versatility of the Weber kettle, which is why when I think of baking sausage rolls, I’m not gravitating towards the oven. I grab my hat and light up some charcoal. 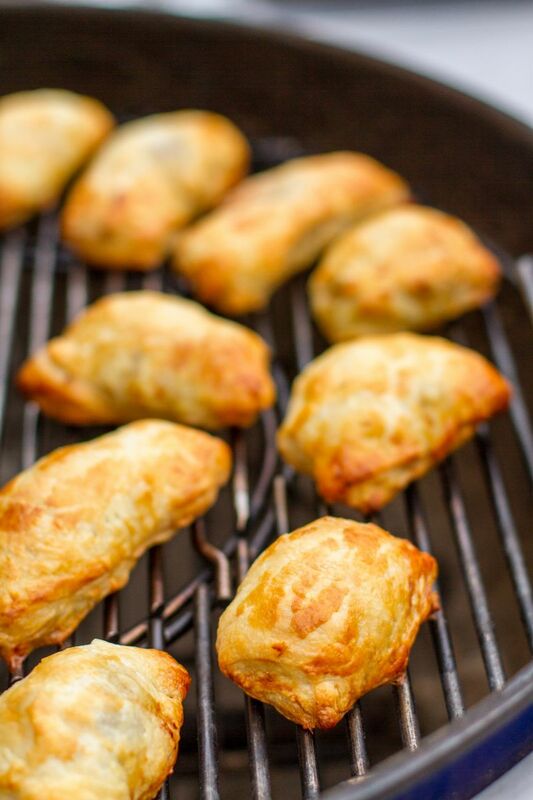 Sausage rolls are satisfying savory bites only enhanced by the kiss of smoke. 1. Unfold the puff pastry on a floured work surface and cut into 12 equal pieces. 2. In a small bowl, combine the sausage, onion, sage, & basil. 3. Spoon a tablespoon, or so, of the meat mixture onto on the puff pastry pieces. Fold the pastry over the sausage to seal. Brush the pastry with the beaten egg. 4. Grill over indirect medium heat (350F) for approximately 20 minutes, or until the meat reaches an internal temperature of 165 F with an instant-read thermometer. This recipe by Jamie Purviance is stellar. 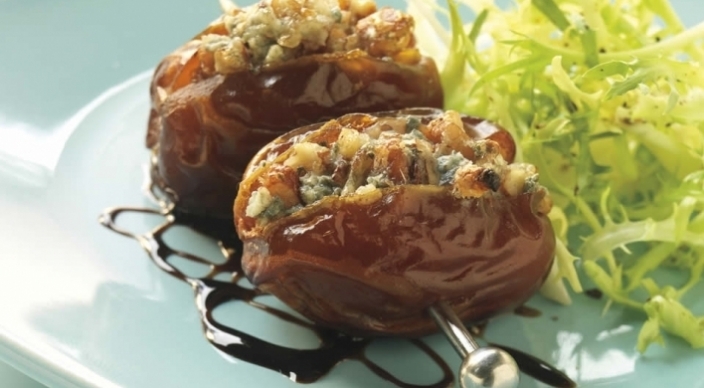 Not only are these incredibly easy to pop in your mouth, the balance of the sweet dates and the intensity of the blue cheese make them downright addictive! 2. In a small saucepan combine the vinegar and sugar. Bring to a simmer and cook until the mixture coats the back of a spoon, about 10 minutes, stirring occasionally. Set aside. 3. In a small bowl mash the blue cheese and pecans together with a fork. Make a small slice the length of each date and pull out the pit. Stuff each date with about 1 teaspoon of the cheese mixture, pressing it closed as much as possible. Thread two dates on each skewer so that the skewer goes through both halves of each date. Lightly spray with the canola oil. 4. Brush the cooking grates clean. Grill the dates over direct medium heat, with the lid closed, until heated through, about 1 minute. 5. Arrange the dates on a platter and let cool for 10 minutes. 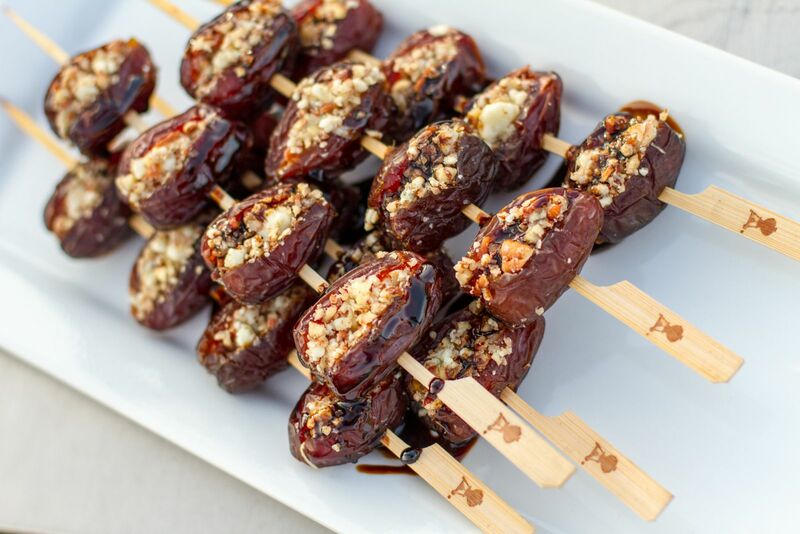 Serve the dates warm with the glaze.